I have been a dentist for over 26 years and my present practice has over 10,000 patients. Recently I have decided to change the instructions I give to my patients that have fixed prosthetics supported by dental implants. This includes NO Flossing. This decision originated through empirical observations and biological facts. 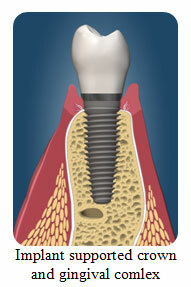 Dental implants are not natural teeth and the anatomy between the two is significantly different. This idea originated while I was writing the article regarding dental implants maintenance protocols. 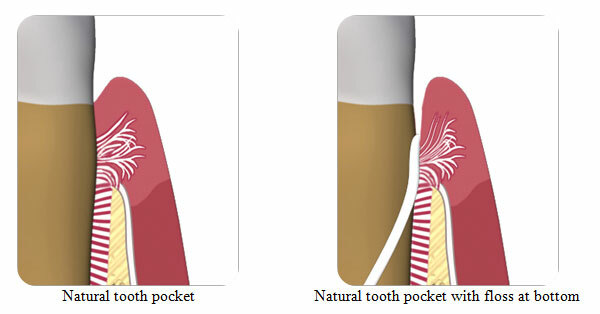 In this article I explain how delicate the connection between the gingival tissues and the implant surface is and how pocket probing may break the connection. Dental implants do not have a cementum layer covering the surface, and thus, a soft tissue attachment similar to natural teeth does not exist. What exists instead is a peri-implant soft tissue seal. (2) In this seal, the junctional epithelium still attaches to the implant surface via hemidesmzosomes, but the gingival fibers do not insert into the implant as they do with natural teeth. The gingival attachment to implants is much weaker and can easily be broken without significant pain to the patient. Operators who are used to probing around natural teeth may inadvertently and routinely probe beyond this weak attachment. Consequently, while routinely probing pocket depths around dental implants, the operator may inadvertently break the seal in 6 or more locations. The results of this are two-fold. The first being a greatly over-exaggerated pocket depth reading, and the second being the creation of passageways through which opportunistic bacteria can gain access to bone and propagate its loss. 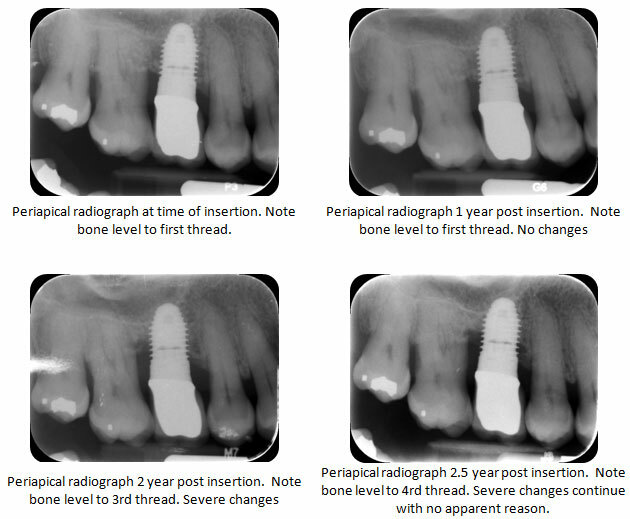 I have been placing and resorting dental implants for over 20 years and have placed thousands of implants that are restored with fixed prosthetics. As any practitioner that has seen this kind of volume I have seen many instances where there is continued inflammation and bone loss around dental implants (peri-implantitis) with no apparent logical explanation. There are several causes of peri-implantitis. The major ones are overload, marginal gap , poor fitting prosthetics and the health of the patient. But if these major causes are eliminated could it be the home care that is causing the bone loss? I had one particular patient that had a full Maxillary arch set of implants and was loosing bone continuously. I inquired about his oral hygiene and the patient indicted that he was using the Water Pick to clean the implants. I thought that perhaps he was using it for a very short period of time so I asked how long and how many times a day he uses it. I could not believe the answer. He was using it 3 times a day for 20 minutes each! This was obviously causing bone loss through traumatic oral self care. After that our office was very careful to instruct patients how to avoid traumatic oral self care. Proxy brushes that are too large for a inter proximal area cause damage, tooth picks that are used traumatically and even hydro flossing devices on the high setting are too much for the peri–implant soft tissue seal to handle. Hand washing is a good healthy habit but habitual extensive hand washing (obsessive compulsive disorder) is damaging to the skin. There are patients in my practice that have had dental implants for over 10 years that have no bone loss and confess to NEVER cleaning their implants other than light brushing. There are studies that show that plaque rarely accumulate on the implant fixtures (1).Many dental practices instruct their patients to floss the dental implants the same way they floss natural teeth. Break the contact and then force it into the pocket from both sides and move back and forth. The floss is thin and the pressure is high enough to easily break any peri–implant soft tissue seal .The area also is not well innervated and thus the sensation of pain will not deter the patient to cause damage as with natural teeth. The above patient Figure had no changes to occlusion and indicated no medical history changes. He did mention that he is taking better care of his teeth by flossing regularly and he was not doing this previously. Is this traumatic oral self care? Using thicker floss and telling the patients to just break the contact and not to go into the gingival sulcus may prevent this traumatic oral self care. However will the average patient have the dexterity, dental IQ and patience to floss dental implants non-traumatically? This begs the question: should then we instruct patients to floss around their implant fixtures? Dental implants are not natural teeth and the same oral self care principles that are applied to teeth may not be appropriate for dental implant home self care. I would appreciate your comments and/or clinical experiences that may support this opinion. 2) Berglundh T, Lindh J, Ericsson I, Marinello CP, Liljenberg B, Thomsen P. 1991. The soft tissue barrier at implants and teeth. Clinical Oral Implants Res. 2:81-90.